How does it happen, you suddenly have five projects that need to reach the finish line? Guess I’ll post the picture as incentive to complete some projects and show you the results. 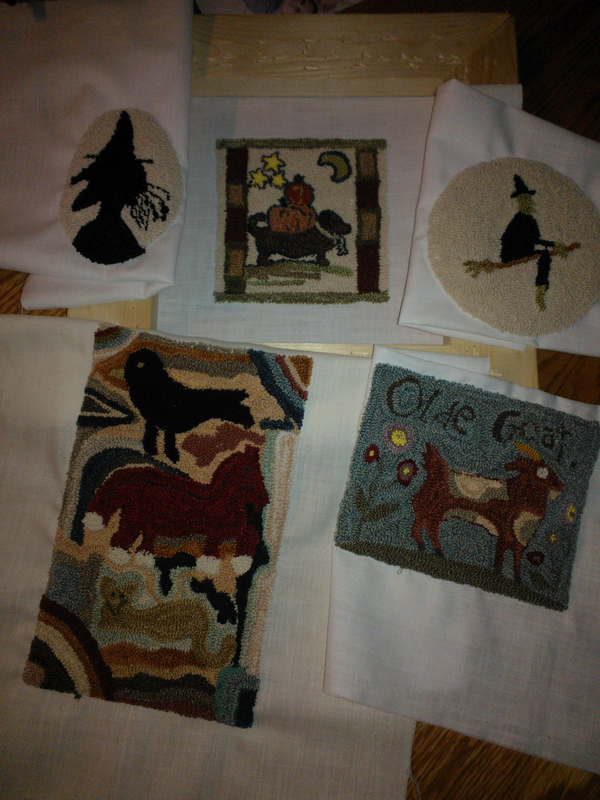 What you see here is a doodle from Primitive Betty, Olde Goat from Lori Brechlin, (Lori’s pattern was in the premier issue of the Punch Needle and Primitive Stitcher magazine) patterns from Rebecca Lindquist, and variation on Magdalena Briner rug. How will they end up? Framed? On a hornbook? What’s a hornbook? Be sure to come back and find out. Thanks Lori. So far it appears creating the PN projects is the easiest part. Looking good! I love how you’ve used daddy’s picture for your banner. Your bunny picture is wonderful. Good luck in your new venture. More conversation on punching plus some new finishes.